Photo: Rafiq Sarlie. Creative Commons license. TPGA is observing Autism Acceptance Month by featuring accounts from autistic people about the differences accommodations (or lack thereof) make in their lives. 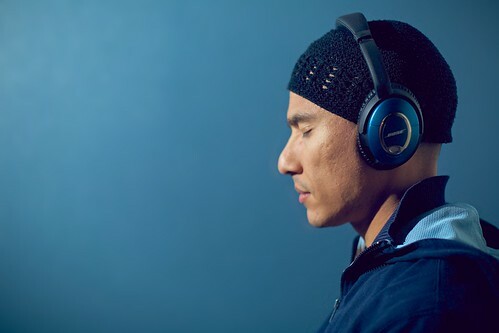 Today's story is from Tito Martin-Nemtin, about the difference his noise-cancelling headphones make in his ability to simply be in the outside world, without being completely overwhelmed. This is also Martin-Nemtin's first foray into public writing. Every time I think about my noise-cancelling headphones, I consider sending Bose a letter. Thinking about Bose gives me conflicted thoughts. As a left-leaning Canadian with socialist impulses, I’ve learned to maintain a healthy distrust for private corporations. Companies that exist for profit often disregard the need for healthy customer relations after they grow to a certain size, thinking only of how they can gain more money. Indeed, Bose is not a company I feel represents me as an individual -- I keenly remember their name included in a list of corporate endorsements for the internet neutrality-destroying political bill SOPA (Stop Online Piracy Act). I remember the commercials I saw during a visit to England, advertising their latest products, with those trendy, young Millennial faces, sporting cutting-edge technology with customizable, cosmetic bits: Hear music clearer than ever! But as a company, Bose is better than most. And in the end, none of these socio-political questions really matter to me; what matters is the product, the Bose QuietComfort 15 headphones that have become a permanent addition to my outdoor wear. How the headphones work: You put them on, then you push a button on the right side. There’s an audible click, and suddenly all background noises -- the buzzing of a fan, the hum of a computer screen, the rumbling of an engine -- quiet to a whisper. The white noise generators inside the headphones cancel out ambient noise, and the padding is insulated enough that you don’t hear the persistent shhhhhh of the feedback within the earphones. For someone like me -- so sensitive to noise that I can actually perceive the bio-mechanical sounds of my own ears ringing aloud -- my headphones are an incredible blessing. I often show my headphones off to other people, both autistic and non-autistic -- who frequently laugh when I mention that the headphone cases come with distributable product cards, containing information about Bose stores and websites. The conceit of turning a customer into an advertiser! But in reality, all it takes is putting on the headphones for a person to notice how much noise is all around us, and how much of that sound can be filtered out. How often we dwell in places with overwhelming amounts of sensory information, and how little we think about how it affects us! If I had to summarize what it’s like to live with Asperger’s, I’d say it’s like this: Living with Asperger’s is like being allergic to the outside world. Acute sensory hypersensitivity is a common part of the spectrum. So the headphones aren’t just for stress relief, or a buffer against sound: They actually extend the amount of time I can be outside, before I put myself at risk. The headphones allow me to sit on a bus without irritation, brave loud sirens without screaming in pain, endure musical jingles that never turn off. They relieve me of my "allergies." This is why I think often about writing Bose a letter: their headphones have changed my life. But I also ponder how much I’ve changed my life to better accommodate their product: I’ve invested in a rotating series of rechargeable AAA batteries to save money, along with a battery charger plugged into the wall -- and I carry a spare battery with me at all times, in case the one in the headphones needs changing. I include the headphones in my list of outdoor necessities: Keys, wallet, phone, headphones -- and sometimes a detachable cord so I can listen to music. The cord is not always necessary, but music is calming and therapeutic. Thinking about those trendy young faces in that advertisement, with their wicked-cool tech and their perfect skin, exemplifying consumer culture as they parade the latest in Bose listening devices, I think about how far away from that demographic I am: A diagnosed autistic, so sensitive to noise that his headphones are all that keep a bad day from becoming worse. I want my demographic to be represented. I want everyone, especially parents, and kids on the spectrum like myself, to know that there’s a way to cut out the noise, and make living in our society much more bearable. I feel like Bose the company -- with its fantastic warranty program, with the emphasis on customer satisfaction, with a keen interest on marketing their products -- needs to recognize how many people are exactly like me, how many people go on the bus and stick their fingers in their ears, and shut their eyes as hard as they can, and pray that they can hold it together just a little longer, that they can bear all the noise, until they can go home, and be safe, and not have a freak out on the bus in front of complete strangers who will look down with fear and pity as the anxiety caves me in, transforms me into a subhuman, crying, moaning wreck incoherently muttering like a "madman" and unable to control the outward expressions of my body. In summary: I want them to know that they can help more people like me. So maybe I’ll write that letter, just like I’m writing this one. And as much as it makes me feel like a shill, maybe I will keep showing their headphones to other people. Because there is no other way to make people who aren’t autistic understand what I need to survive their world.